Best Back Pain Relief Exercises – Easy & Effective! Are you feeling tense, soreness or pain in your back? Are you tired of the muscle aches, shooting pain and movement-related discomfort in your back? Back pain and discomfort are becoming more common in our daily lives because of the sedentary nature of our lifestyle. People are sitting down, slumped over studying or working too much and generally not engaging core and back muscles. Back pain can occur due to many different situations depending on each person and their lifestyle. Some causes are a simple lifestyle habit, while other causes can be a serious concern which needs to be diagnosed and treated by a doctor. Fortunately, many back pain occurrences can be treated by simple lifestyle changes and at-home exercises. If you’ve had a long day at the office and feeling discomfort, get yourself into a comfortable space and give these these 3 simple, easy and effective exercises to improve your quality of life and relieve your back pain! This is a super exercise to work on your back – both in mobility and stretching areas of training. 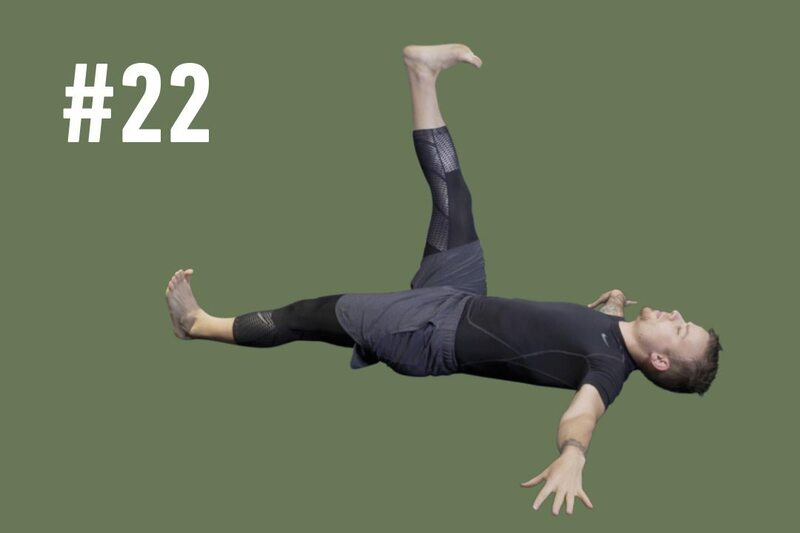 START: Lie on your back, place your legs straight out on the ground and stretch your arms out to the sides of your body. Your palms of your hands should be facing down. STEP 1: Fully stretch one leg upwards to the sky until it forms a 90-degree angle to your body. Then, turn your hips from this position and touch the floor with your right foot so that it is parallel to your arm on your left side. STEP 2: Bring your leg back to the upward 90-degree angle. FINISH: Afterwards, return your leg to the starting position. 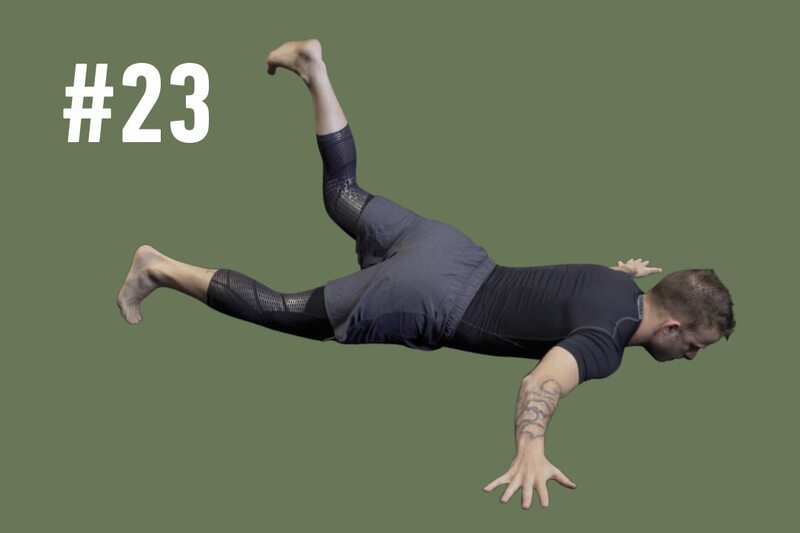 Keep hands, entire back and head on the ground for the duration of the exercise. Flex your feet at all times. Move slowly and feel the stretch in your back and hips. Access more back relieving training, exercises and information here. This is awesome to slowly relieve your back muscles while giving your abs a little workout! 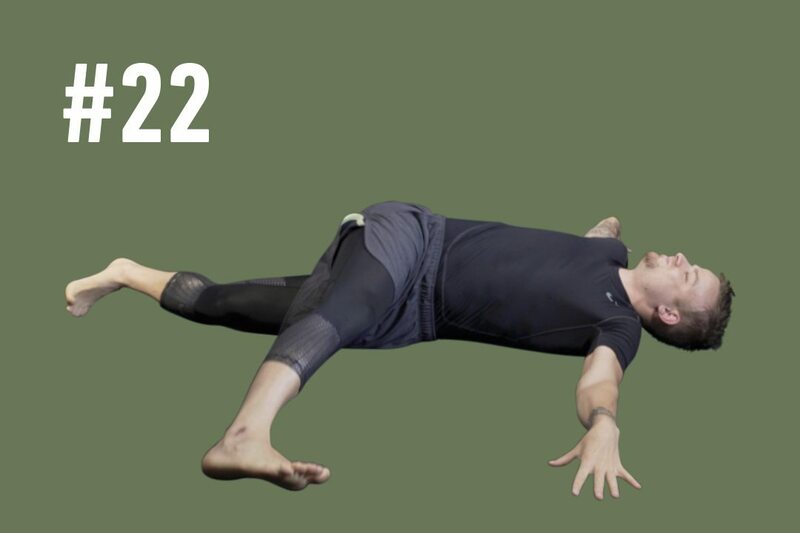 START: Lie flat on your back and place your arms out to the side of your body. Lift your legs into the air and bend your knees to create a 90-degree angle with your body. STEP 1: Swing your hips to the right so that the right lower leg finishes at the point just above the ground. STEP 2: Then, swing your legs and hips back to the left side, with the left lower leg finishing at the point just above the ground. FINISH: Keep swinging your legs to either side in fluent and respective movements. 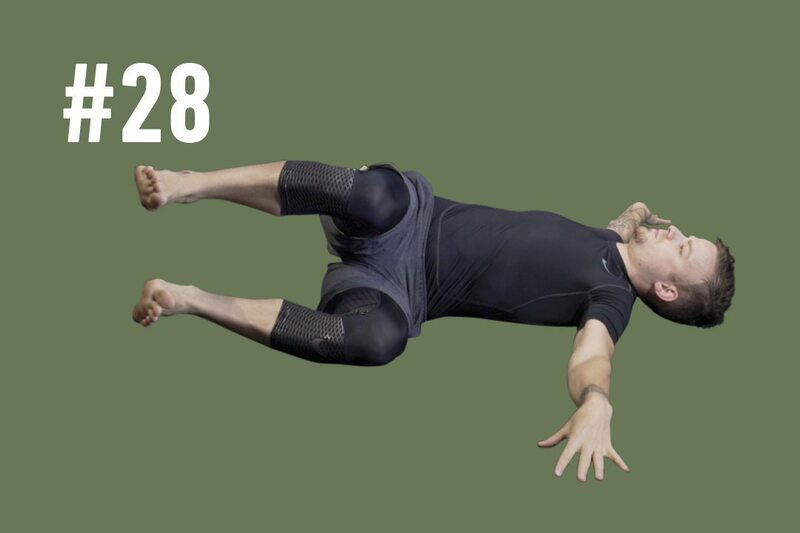 Once you have finished, return your legs to the 90-degree angle in the middle of your body. Then, lower your legs back to the starting position. Keep the same distance between your knees and legs during the entire exercise. The distance should be about hip width apart. Keep your feet flexed. This will give you a nice calf stretch. Keep your entire back, head, arms and hands on the ground during the exercise. Are your back muscles weak? Learn how functional training can help strengthen your body + reduce back pain. This is a great exercise to test your mobility, flexibility and give a good stretch for your back. Just note that this exercise is a little tough, so if you feel pain while executing these actions, I advise you stop doing these movements until you feel you can. 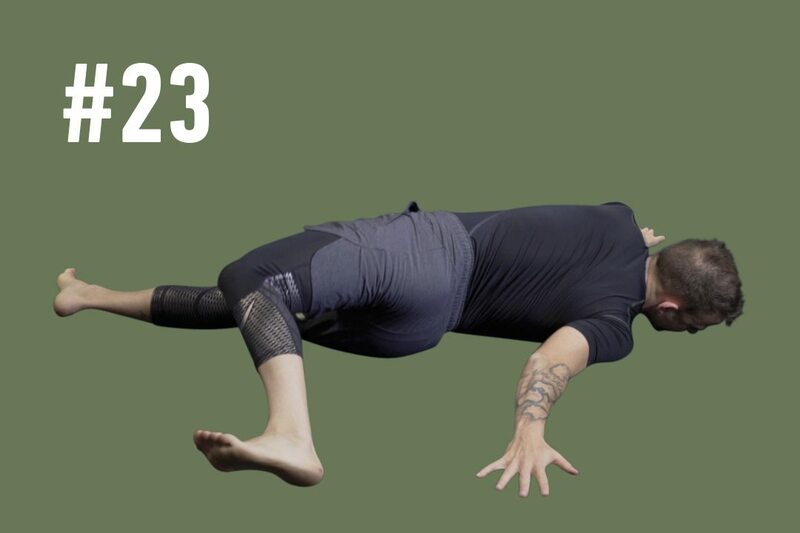 START: Lie flat on your stomach with your chin on the floor and with your arms outstretched to the side of your body, palms of your hands facing down. STEP 1: Bring your left leg up into the air and slightly bend your knee. STEP 2: In a fluid movement, slowly swing your left leg and left hip outwards so that you touch your left heel on the opposite side of your body. FINISH: Slowly return your leg back to the starting position. Move very slowly. This exercise is working sensitive areas so you must take care not to strain your back and hips. Only move your dynamic leg to the point where you feel comfortable. If you cannot get your heel to touch the ground on the opposite side, that’s fine! Just do what you can. The most important thing is to feel your back stretching! Give yourself the high quality health you deserve. 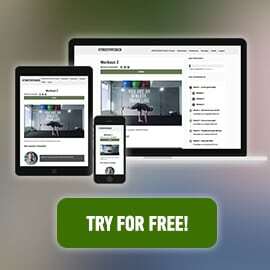 Try the free #TRUSTMYCOACH Trial today and let's strive for a stronger, better life! So there you go - my 3 favourite exercises to help relieve back pain. Try and do these exercises for 5 minutes every couple of days! By incorporating these movements into your lifestyle along with consistent training and stretching, your back and body will feel better for it! In the workout below, you will feel your entire back stretching and releasing, engaging and working hard. Try these exercises out and let's work towards a pain free and stronger life! For more information or exercises to increase your core and back strength or to help reduce back pain, go to www.trustmycoach.com ! I hope you feel better soon! Look after yourself, you deserve to live a life pain-free! NOTE: See your general practitioner immediately if: your back pain doesn't improve after a few weeks, the pain increases or moves to your legs, you experience numbing or tingling sensations, or if you experience internal problems such as a fever.